Since we recently finished My Father’s World’s kindergarten curriculum before leaving Alabama, we decided to jump right in to the first grade curriculum upon arriving in the DC area! This particular curriculum leans heavily onto history and the Bible, and first grade is no different. What makes this year so interesting, is the focus on the Bible history, and specifically the history of the Hebrews, since the Bible and Christianity begins with them. As part of our study, we’ve been looking into Jewish customs (attending a service at a local synagogue – more later) and Jewish holidays. So I was very excited to realize that we could celebrate Purim right here in the US. Not being fully prepared ahead of time, I was able to find a great Palestinian restaurant, The Jerusalem Restaurant. (I also used a sale on Restaurant.com to get a gift certificate dirt cheap, which saved us a ton on our bill! Get on their mailing list to find out about their great deals!) This is great, because part of celebrating Purim is having a feast, and what better way to celebrate with “local” food! 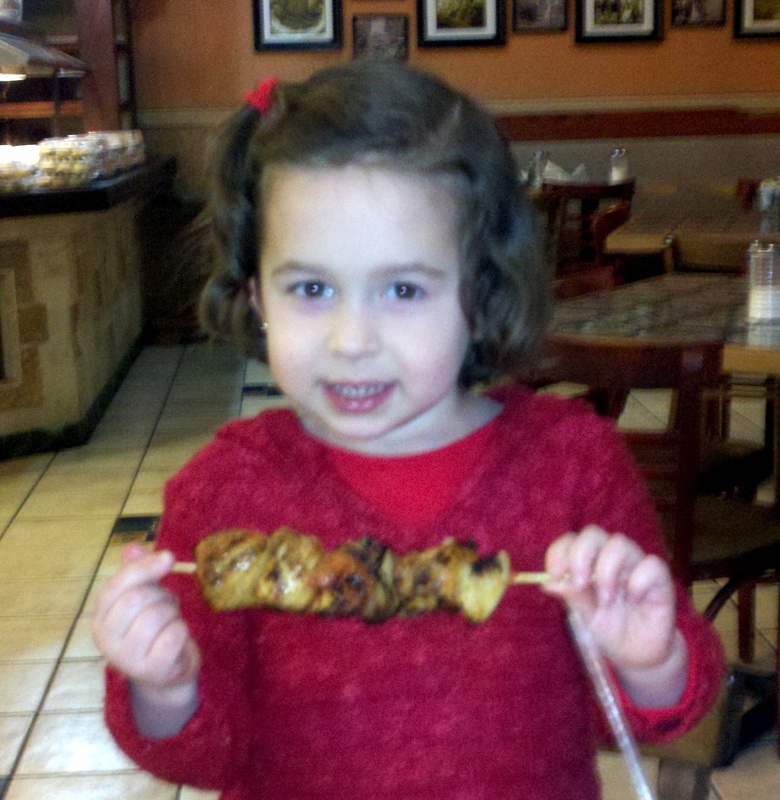 The girls had chicken kabobs. 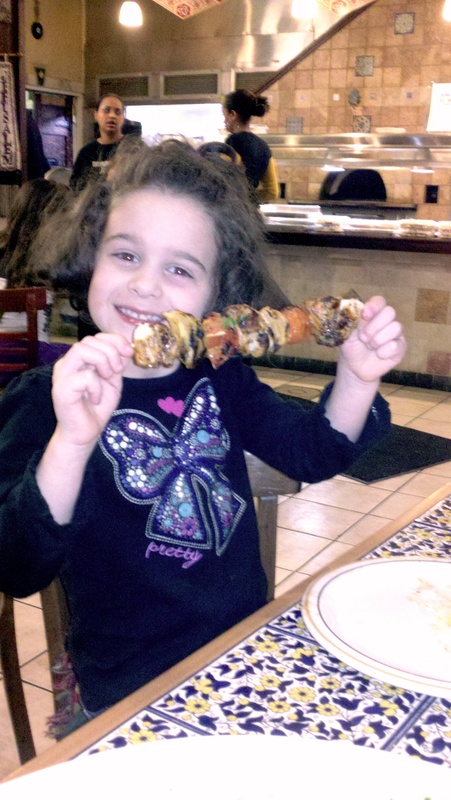 Meat on a stick is always a winner. 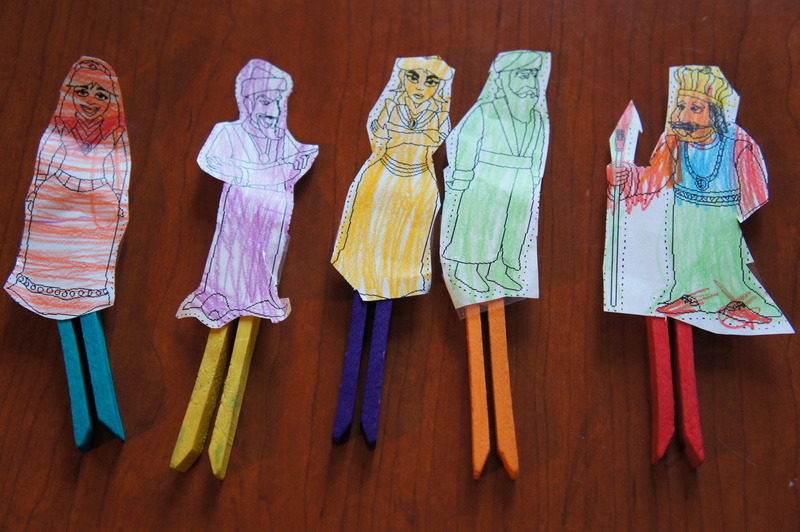 Later on, we cut out the colored characters, and then created these “puppets” to tell the story of Esther. We really enjoyed our experience celebrating Purim, and next year I’d like to do it again, this time letting the girls dress up as “Princess Esther” (since we’re obsessed with princesses anyway) and act out the story, perhaps recruiting some of their friends to join us!